My husband and I are at the divorce-affair-midlife crisis stage. Not for ourselves (fingers crossed) but for what feels like way too many people around us. I won’t pretend to know what each couple that split is dealing with, and I don’t really know how bad it can be, how deep the cuts can go, how emotional neglect and ambivalence can sear the soul, and how words and deeds can cause such fragmentation. 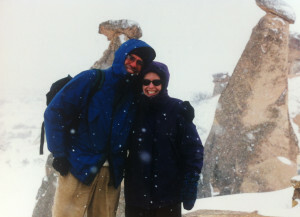 But as anyone who’s been hitched for more than ten minutes knows, marriage is a process, a long journey not meant for the faint of heart–some days it’s a summit with a breathtaking vista, and other days it feels more like a jagged, treacherous rock scramble. After more than 15 years of wedded bliss (wink, wink), I do have weeks or months where I feel like we’ve hit a rocky path, a rut, or at best, a relationship plateau. Sometimes I wonder what keeps us going. Honestly, we both can be kind of oblivious, living our lives of kids and work, on-demand TV, and Facebook. What snaps us out of it? The strange thing is that it often takes a bit of hardship, sprinkled with emotional angst, and peppered with the ‘laugh or sob’ hysterics (‘hysterics’ all mine) that get us out of the rut or off the precipice. These so-called ‘hardships’ work to fill in the cracks and smooth over the ruts of what was once a blindly hopeful relationship. We struggle through, and in the end, we are a little closer, a bit stronger, and a lot more deeply rooted. Where do we find these experiences? As much as I hate to admit it, it’s not during the constructed date nights and pampered getaway weekends that we grow closer. Instead, it’s in the challenging experiences that we learn to really see each other again and remember the days when we were so stricken with love that we were able to think of little else but each other. Maybe that’s why we love traveling so much. Traveling provides a crucible for relationship testing. It puts us outside the everyday experiences of the “go to work, do errands, keep the kids from bickering” lifestyle. On the road, as we figure out how to get from point A to point B, when, where and how to eat, keep hydrated, where to sleep, and who to meet, we get to see each other’s strengths (and weaknesses) in a new light. Many of the best stories are a bit adventurous and hint at danger: hitchhiking in a blizzard in Hveragerei, the eight-hour cliff-edge ‘hike of death’ in Phuket, shady men in suits plying us with drinks in Istanbul, paperclip door locks on rooftop shacks in Jerusalem, the finger-snipped Japanese Mafia man in Hokkaido. It’s the retelling of these travel stories of struggle, frustration, and success (or at least some level of completion/survival) that maintains that awareness of one another that once came so easily as newlyweds. They help remind us what each of us brings to the table when it comes to the smooth functioning of our marriage and family. Adding kids to the mix, our story list goes on and continues to grow, though generally with slightly less real danger. But just the same, like a butterfly unable to survive without the death-defying fight out of its chrysalis, the clarifying power of these ‘uncomfortable at the time’ struggles are essential to our survival as a couple. This past summer when we were traveling through Central America for nine weeks with our kids, we noticed a distinct pattern that whenever we were at a more luxurious hotel or an all-inclusive resort, Dylan and Abigail were at each other’s throats. Sit them for four hours, three or four to a seat, on an un-air-conditioned chicken bus where the location of their next meal remained questionable, stops seemed to occur randomly along the road, and the evening’s accommodations were still up in the air, and the kids worked together like a well-oiled machine. They discovered power in teaming up to achieve a common goal, particularly given the numerous times their non-Spanish speaking parents had to rely on them to communicate with strangers. Gazing intensely at each other, as new lovers often do, eventually leads to uncovering glaring faults and inevitable dissatisfactions in one another. After all, no one is perfect, regardless of how exceptionally they present themselves initially. Looking out in the same direction though and focusing together on a goal helps avoid this pitfall. So Jorge and I look at the map, stick in pins, and plan our next escapade—making sure to leave room for a bit of hardship. Together, hell or high water, we make our way, take risks, and make the memories-turned-family legends that remind us to keep the focus on how we work together, not how we fall apart. And then we wearily come home and look at pictures, and write, and tell and retell stories. We laugh and shudder at our recklessness and sometimes even glimpse the hand of God in our survival. Most importantly, we take a step closer to each other in this combined journey of discovery, love, and struggle, all the while having one foot out the door toward our next odyssey.